I ask God that my blood would serve to bring peace to divided Mexicans." He was born in Totalice, Mexico on July 30, 1869 to a very humble family. He worked in the fields until he was 19. In 1888 he entered the seminary of Guadalajara where he distinguished himself by his piety, honor, and hard work. He was ordained a priest in September 1899 in the Church of Saint Teresa of Guadalajara. He was given the responsibility of chaplain and vice principal of a school of arts and trades in Guadalajara. He organized catechism centers and schools for those of living in the countryside. He constructed a dam to aid in irrigation, founded homes for orphans and small plots of land in order to help the poor. He worked in the Parish of Totalice for 17 years before he was shot. 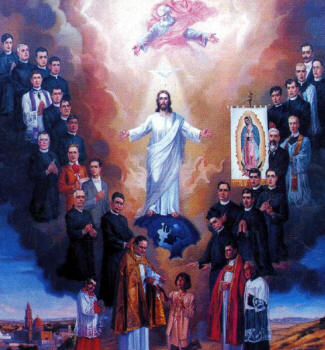 On may 21, 1827, the priest went to celebrate a religious feast on a ranch, where a fight was begun between the cristeros and the federal roces commanded by General Goñi. He was arrested and taken to Totalice where he was imprisoned together with his Vicar Fr. Caloca. They were martyres fo the persecution against the cristeros. They were moved to the municipal palace in Colotitlán where they were shot on May 25, 1927. Fr. Cristóbal, before being shot, said, "I am innocent and I die innocent; I forgive the authors of my death from my heart and I ask God that my blood would serve to bring peace to divided Mexicans." Canonized by Pope John Paul II on May 21, 2000.